The pictures of the ports are based upon pictures of actual port molds. The 4V intake port, which is a 1/2 inch higher port, has a deeper valve pocket and a much more gradual short turn radius. This means the 4V port can operate at much higher gas velocity than the 2V port. I know this isn't a popular proclamation but it is true none the less. 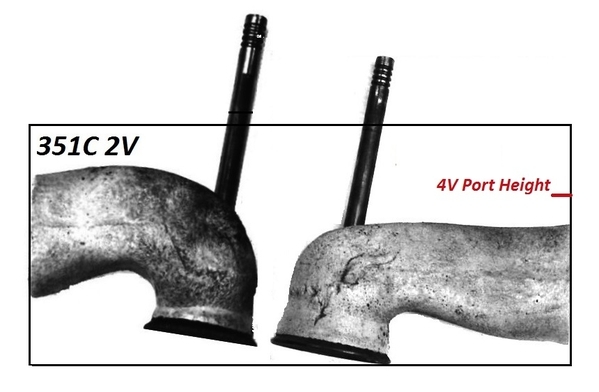 Both 2V and 4V intake valve pockets are much more distinct than modern port designs. This stems from the desire to promote swirl within the intake valve pockets, which would theoretically distribute air more evenly around the valve head and into the cylinder. 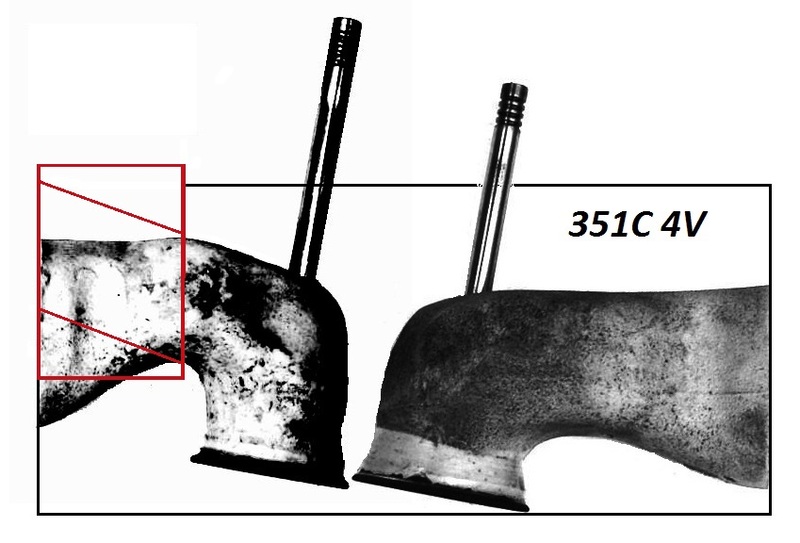 Intake valve pocket swirl in the 351C was not 100% reliable, and if it occurred it occurred only at higher valve lifts. The 2V exhaust port is a gently radiused port, whereas the 4V exhaust port makes a sharper turn. 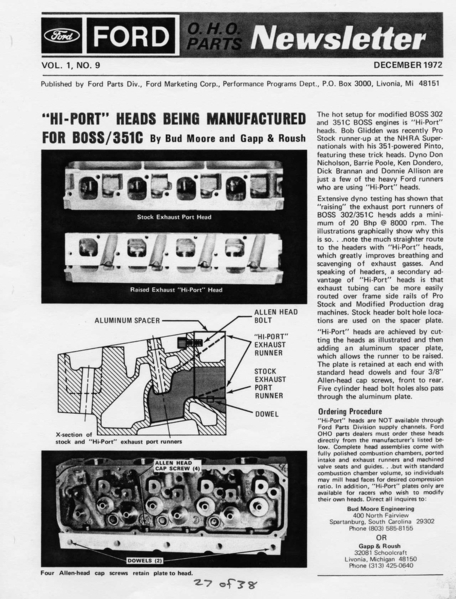 Its hard to believe the same engineering team designed both ports. Until you look at the third picture! The 4V exhaust port mold reveals the angle of the port roof, which is not gently radiused like the 2V exhaust port. The mold reveals the 4V exhaust port has a distinct upward sloping angle; that angle makes it rather obvious the "hi-port" plates they used to install on the exhaust side of the heads for racing were not after thoughts, the exhaust port was designed with the intention to modify it with "hi-port" plates.